Some days we have to ninja battle with puppets to get two years olds to smile, other days they show up ready to do whatever it takes to make moms heart flutter with love. Last night's sunset cutie was definitely the latter. She was such a precious little doll, so willing to do whatever it took to make the picture perfect. She just smiled and smiled. What a wonderful happy little toddler, and she seemed rather contempt just being on vacation. Her little smile truly made our session perfect and warmed our hearts. 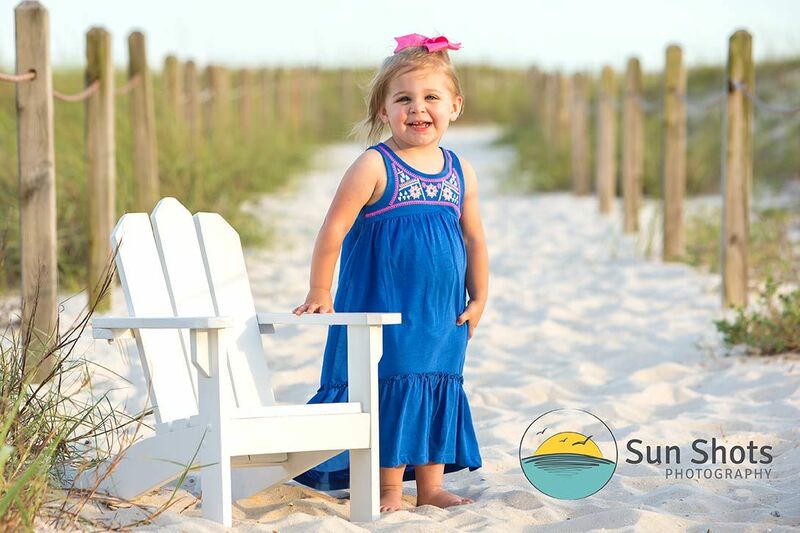 Thank you so much for doing your homework and choosing Sun Shots to be your Orange Beach Photographers. We really enjoyed working with your little princess, and hope you have a wonderful trip and a safe voyage home. Thank you for trusting these precious memories to us to help create! If you have a happy baby and are looking for family portraits that go above and beyond, look no further, we would love to speak with you about your very own family photography session. We are a husband and wife team, and we really love making art that stands far above the crowd. In today's digital age, it is easy to get good photography every once in a while, but extremely difficult to get "GREAT" photography all the time. This is what we feel separates us from the rest. We are extremely dedicated to the true artistry of professional photography and are proud to only present "GREAT" art to your family. Mediocre just doesn't cut it in our book! So please check out our main website, and go to Google and read all of our reviews. Do your homework. We are positive you will see why we are the best choice to achieve exactly what you are really looking for. You can reach us anytime at (251) 968-2119 for call us today and let us show you why we want to be your photographers while you are on vacation in Orange Beach.